Many women find that this is the most comfortable and energetic time of their pregnancies. Morning sickness usually eases off now. Your baby bump is likely to ‘pop out’ any time now. Your breasts are starting to make colostrum. You might notice small skin ‘tags’, which often appear underneath the breasts. They’re nothing to worry about, but you can discuss them with your midwife or doctor if they’re bothering you. Staying active can help you feel better during pregnancy. It can improve mood, fitness and sleep, boost energy and ease back pain. Physical activity and healthy eating during pregnancy might also reduce the risk of you having gestational diabetes, pre-eclampsia and too much weight gain. It can also help keep you strong for the birth. Walking is a great form of exercise. To help get you motivated, you could ask your partner or friend to go for a 30-minute walk with you. Unless you’ve been told otherwise by your health professional, you could start with three days a week and see if you can build up to five. If you’re feeling tired or nauseous, you might want to go a shorter distance or try again the next day. Ask questions at pregnancy appointments or check with your GP if you’re unsure about exercise during pregnancy. If you’re not confident speaking English, ask for an interpreter at your pregnancy appointments. If one isn’t available in person, ask whether you can have a phone interpreter. You don’t have to pay to use an interpreter. You might also be able to get help from a multicultural health worker to do things like book or check your appointments, fill out forms and get transport to your appointments. Ask if there is a multicultural health worker available. 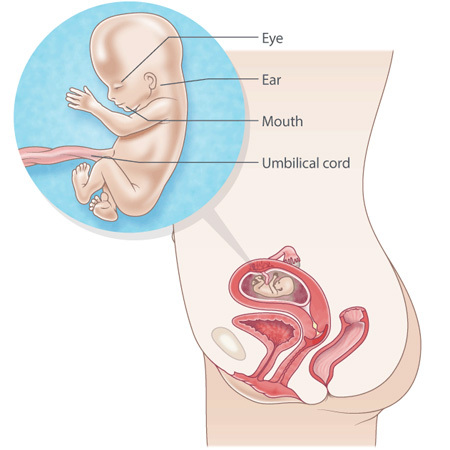 Your baby is about 8.5 cm from head to bottom, and weighs about 45 gm. Your baby’s face looks much more recognisable now, and its neck is longer. Reflexes are working. If you touched your baby’s hands or feet, they would close or curl.